October is Member Month – Renew or join now to save and potentially win a prize! There are a number of incentives being offered this month. 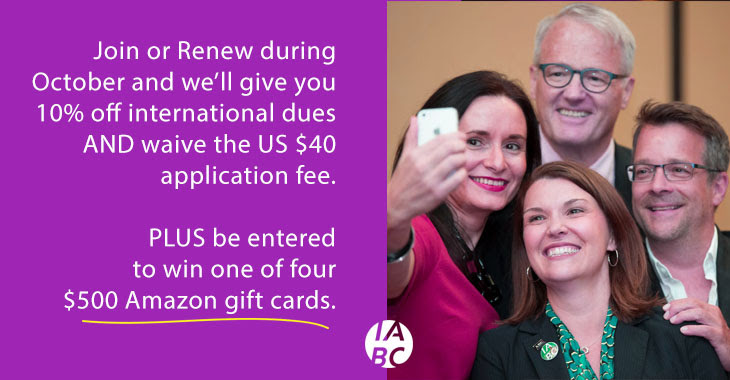 New and lapsed members who join or reinstate will receive a 10 percent discount on their International IABC dues and have their $40 application fee waived. This dues discount is a one-time offer and only available for October 2016 Member Month. They will also be entered in a drawing for one of two $500 Amazon gift cards, just for new and reinstating members. Current members who renew in October will receive a 10 percent discount on International IABC dues. They will also be entered into a drawing to win one of two $500 Amazon gift cards – just for renewing members. Members who refer new members to join IABC will receive a $10 Amazon e-gift card for every new or lapsed/reinstated member who lists them as a referral source. Members may not list themselves as their referral source. There is no limit to the amount of e-gift cards a member can earn and e-gift cards will be sent with IABC branding. Members who refer peers will be recognized on the IABC website as a Community Champion for the months of November and December. We will also provide special recognition at the IABC 2017 World Conference as an IABC Champion. Need a reason to join or renew? Check out all the benefits membership provides! Renew, join or refer now!